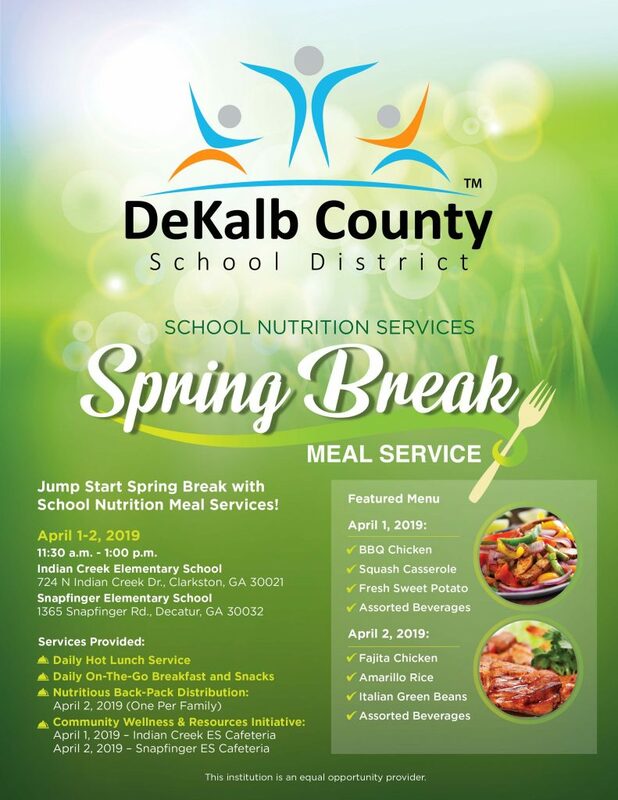 Students at DeKalb County School District (DCSD) will not have to miss a school lunch during a portion of Spring Break 2019 thanks to School Nutrition Services. On April 1 and April 2, DCSD will offer daily hot lunch service, on-the-go breakfast and snacks, and other services to all DCSD children who can attend at Indian Creek Elementary and Snapfinger Elementary beginning at 11:30 a.m. until 1:00 p.m. Additional resources will also be available at certain locations on specific dates. Menu items on April 1 will include BBQ chicken, squash casserole, sweet potatoes, and assorted beverages. On April 2, students can enjoy fajita chicken, Amarillo rice, and Italian green beans. DCSD families can also take advantage of free community wellness resources. On April 1, health services can be found at Indian Creek Elementary. On April 2, these services will be available at Snapfinger Elementary. In addition, on April 2, nutritious backpack distribution will take place at each school. Because resources are limited, backpack distribution will be limited to one per family. Indian Creek Elementary is located at 724 N. Indian Creek Drive in Clarkston. Snapfinger Elementary is located at 1365 Snapfinger Road in Decatur. For more information, visit the DCSD’s School Nutrition Services website at www.dekalbschoolsga.org/school-nutrition. WHEN: April 1 and 2, 2019, 11:30 a.m. to 1:00 p.m.